When I visited KL, I just wasn’t sure what to expect. On my first adventure to Asia, none of the long term friends I had met encouraged me to go there and the phrase that kept recurring was that it was a ‘poor man’s Singapore’. Two towers and an airport, that’s all it has to offer. Why bother going to a big city in that neck of the woods when Singapore was only a stones throw away? I’ll tell you why; because Kuala Lumpur is cool AF. First things first – let’s talk accommodation. I personally enjoy staying hostel when I backpack. It’s a great way to meet people and there’s a real sense of community in sleeping in a room full of strangers. However, after an 14 hour flight (with a 4 hour stop over in between) I was looking for some comfort. We prebooked the Impiana Hotel in the heart of the city for 1 night, for a mere £32. The hotel was beautiful and lavish, with an infinity pool, a room with a dreamy view and fluffy bathrobes to boot. Something that really shone from the offset was how much you could get for your money in Kuala Lumpur. We lived like kings for very little money, stretched out in our double beds after a long afternoon swimming in the infinity pool. If you’re jet lagged and in need of some TLC in the form of a good nights sleep and powerful air con then I suggest you get yourself down to the Impiana Hotel. Our second night sleep was considerably more modest than our first, albeit still pretty spectacular. We left the Impiana and headed to BackHome hostel for one nights stay, in hope of meeting some fellow backpackers ahead of a backpacking trip around Malaysia. The hostel was £14 for a private room, which is considered expensive for a hostel in South East Asia, however it was pretty special. We had a double bed each (still bunk beds so we didn’t feel like complete cope-outs), wardrobes, bathrooms with hairdryers and lots of common areas for socialising. Everywhere was clean and the staff were very helpful, even when we had to leave at 4am to get a bus to George Town. In terms of getting around KL, we opted for the Metro due to the fact that it was so easy (and ridiculously cheap). Having spent the majority of my life navigating my way around London’s underground stations, the Malaysian Metro seemed like a piece of cake. If you’re feeling tired or lazy, then of course the taxis are still very cheap and we always found they easy to flag down. However, try to agree a price before you arrive at your destination as we were prewarned that often they hike up the prices for tourists.We then experienced this first hand when we were told that we were being charged double fares because it was a Saturday afternoon ( which we obviously paid because we were to sheepish to say no). 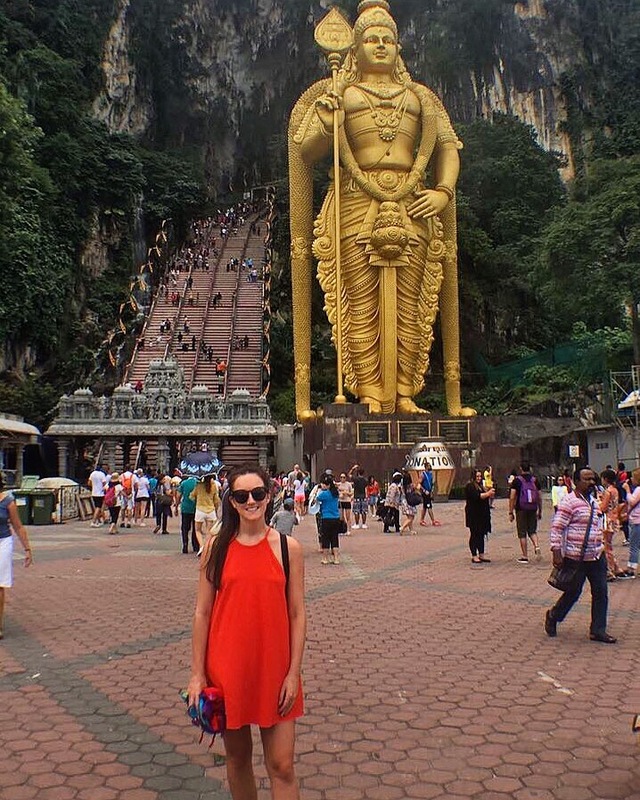 Batu Caves – a very popular tourist spot thanks to the big gold statute that stands outside the caves. A quick visit is all that is necessary though, as far as I’m concerned if you’ve seen on cave you really have seen them all. 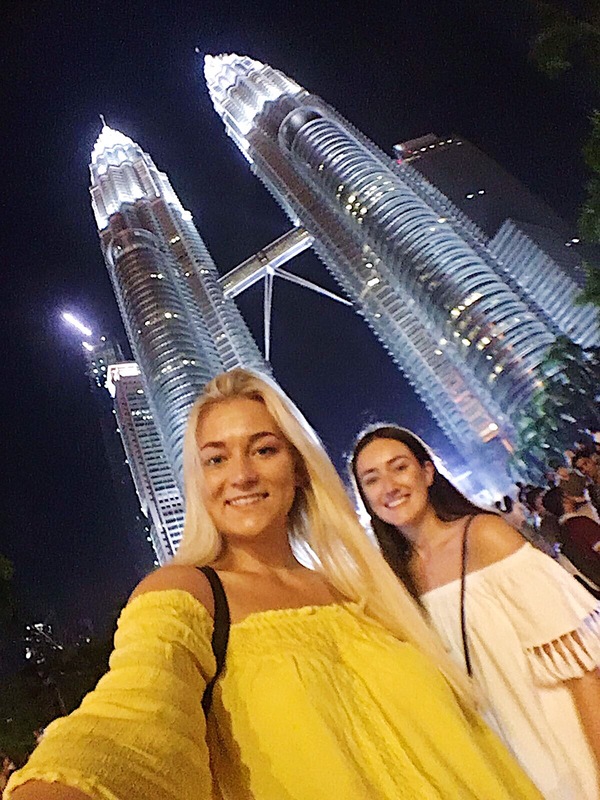 Petronas twin towers – although we didn’t climb up the towers, trying to get a selfie in front of them was a mission itself! There are literally hundreds and hundreds of people scattered around in front of the towers, hoping to get ‘that shot’ for their Instagram. Grab a selfie stick and joi the fun! Jalan Aloe – Street food mixed with a market and probably the best place to try local delicacies. Not actually as cheap as some of the other food I have tried in Asia however it’s still pretty reasonable, and a great insight in local life. I loved the time I spent in Kuala Lumpur (and Malaysia in general, but I’ll cover that in another post) and I would recommend it to anyone looking to visit a city in SE Asia. It’s cleaner than Bangkok, and cheaper than Singapore – what more could you want? !